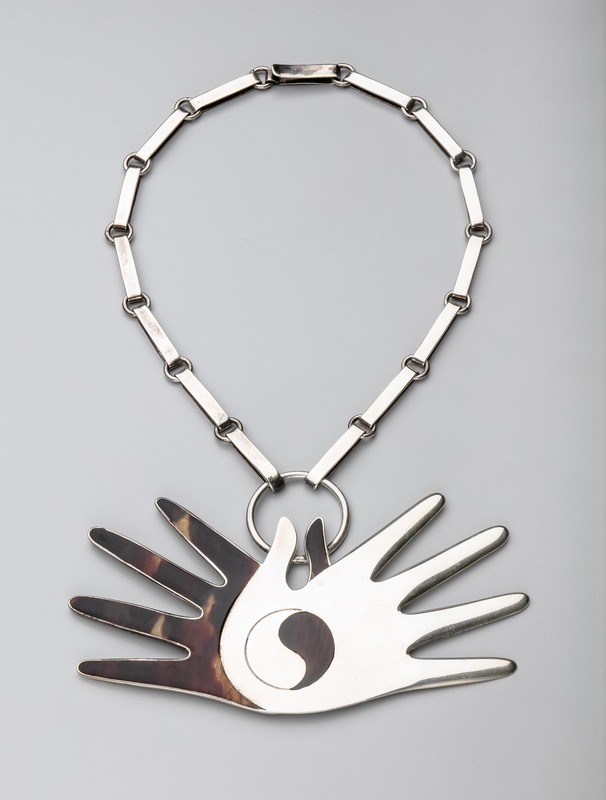 A sterling silver and tortoise necklace designed as crossed hands by William Spratling (1900 - 1967). Spratling, an American artist and professor of architecture at Tulane, settled in Mexico in the 1930's where he became a master designer of jewelry and objects. In this iconic necklace Spratling combines two favorite motifs; one being hands; the other mixed materials. Hallmarked with the conjoined WS mark Made in Mexico, 925 and the eagle 30. The pendant is 4 5/8" long by 2 3/8" wide. With the original chain, the necklace is 20" long. Excellent with minor wear consistent with age.